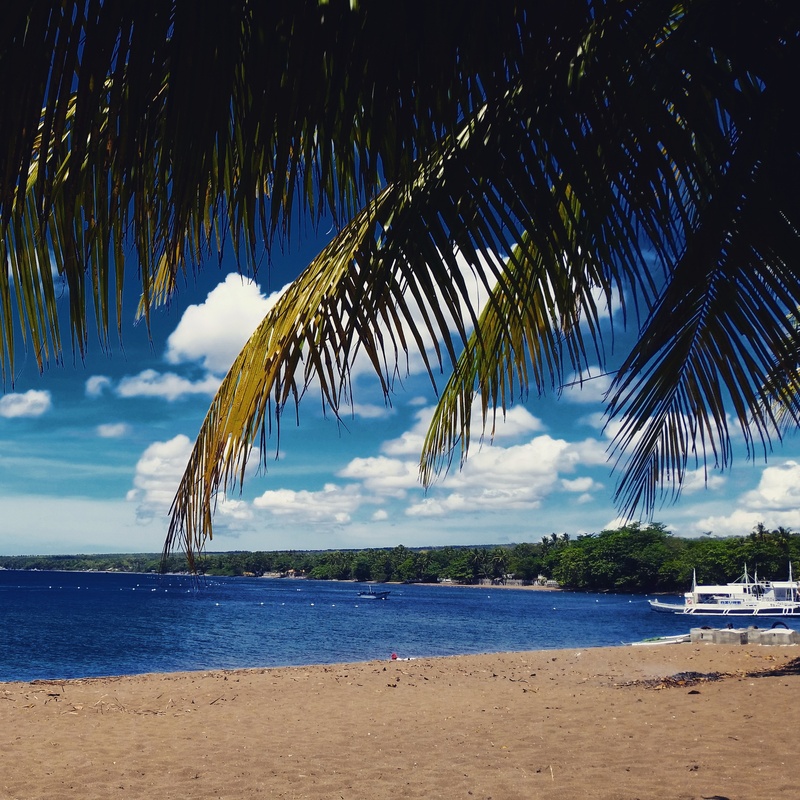 We arrived in Dumaguete exhausted and ready for some R&R. Impatient to get to our hotel, we allowed ourselves to be overcharged for a taxi, shelling out $6 for a fifteen minute drive. Sometimes you’re just not in the mood to haggle, and the extra $3 is worth it for a ride without argument. Our hotel near downtown was decidedly dumpy, with stained walls, a sad foam mattress (which was shockingly comfortable), and a scummy bathroom. At least the sheets were clean and the air-conditioning worked. We’re not too picky when traveling in developing countries, and dumpy is better than squalid. Plus, this place had a great rooftop bar with live music, a pool table, and a nice view of the mountains. My brother, Joe, had arrived the day before by way of Cebu, catching a proverbial chicken bus for five hours, a ferry, a taxi and a motorbike taxi just to get to Dumaguete. We found him on the roof, shared some free breakfast (toast, sticky rice, coffee, avocado and mango), and headed out to arrange scuba diving and snorkeling. Even though our hotel had an in-house dive shop, I always like to find the outfit with the best reputation, usually a PADI 5-star establishment. After all, diving can go very wrong if your gear is old or your divemaster negligent. I settled on Liquid Dive Resort in Dauin, 10 km from Dumaguete. By the end of the day, I had a scuba/snorkel trip to Apo Island lined up, as well as a couple days of shore diving in Dauin. I won’t bore you with the details of our diving/snorkeling days, except to say that Apo Island was lovely, the water a surreal tropical turquoise, and both Ben and Joe got impressive sunburns. We got to see some really unique sea creatures, such as a crocodile eel, a hairy frogfish, some highly venomous sea snakes, a couple delicate pipefish and seahorses, a stingray and quite a few sea turtles. You can see a video from my dives here. Get away from my anemone! One of many gorgeous sea slugs. Lionfish are not nearly as ubiquitous or invasive here as they are in the Caribbean. Seahorse attached to trash, with sea eels in the background. The reef was in pretty good shape, but with a few dead spots and a very depressing amount of trash from shore and visiting boats. My divemaster told me the Philippino tourists who visit Dumaguete and Apo Island are the worst perpetrators in this regard, but this was of little comfort. The trash situation is always one of the hardest parts about traveling overseas. That and the street dogs. 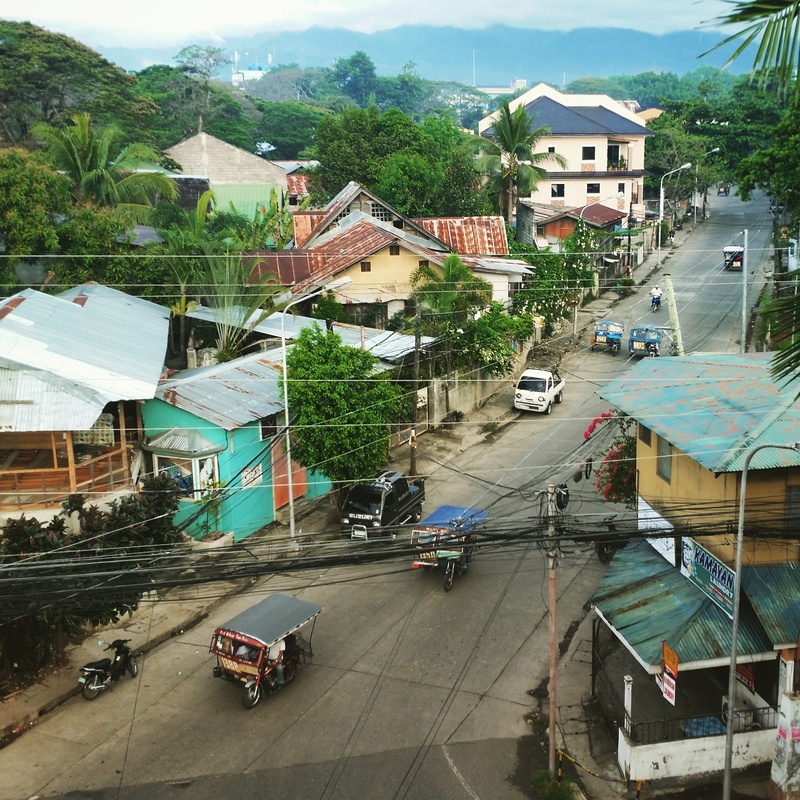 As much as Negros Oriental is a tropical paradise, it also quite visibly suffers from the maladies of the developing world: trash piles, open sewers, shanty slums, and ubiquitous mangy street mongrels. These things are hard to see sometimes, but one must suspend judgement and realize our perception is colored by our privilege, and furthermore that our collective consumption habits perpetuate these problems abroad. We are all connected. There is a rawness here, and in many of the places we travel, necessitated by the density of human life and the limitations of available resources. The Philippines, however, has a higher average standard of living than many of its neighbors. Most people in Dumaguete, a medium-sized university town of about 100,000 residents, appear fairly comfortable. Hacienda-style houses can be seen alongside bamboo hovels, and shiny new SUVs weave through the streets amongst rusted old motorcycles. It is a hodge-podge of cultures and colonial influences: signs are mostly written in English nation-wide, conversation is held in a number of local languages (here it is Cebuano–an interesting combination of Spanish and indigenous language), Japanese vehicles are the most common, and French baked goods are sold on street corners. You can find food of almost any persuasion: native dishes like kinilaw (similar to ceviche), Caribbean-style barbeque, sushi, French bistros, Italian pasta, American burgers, and even Mexican food. Informal eateries offer a variety of home-cooked dishes in metal pots on a table, usually for about 50 cents a serving. The drunken airport Canadian was definitely wrong about the cuisine. In fact, we likely gained a couple pounds in the last week. On our last full day in Dumaguete, I was prevented from diving by middle-ear barotrauma I sustained while diving the day before. Basically everything sounds muffled, my ear canals are swollen and slightly painful, and my ears pop and click every few seconds. Unpleasant, but at least I can be assured I will avoid infection since I’m already on antibiotics for strep throat (don’t ask). I didn’t feel like rupturing an eardrum, so I aborted my last day of diving and instead we rented motorbikes to aid our landlocked exoloration. We spent the morning lounging on the Dauin beach reading and swimming, but as the day heated up (it’s about 90 degrees everyday and stiflingly humid), we headed for the relative cool of the forested hills and Casaroro Falls. Ben and I had tried to visit the falls the evening before, but after a 45-minute motorbike ride up the hill, darkness was rapidly approaching. So while we enjoyed a lovely evening ride through the contry, we were itching to return and see the falls. We stopped at an eatery, chose a random and unidentifiable dish from the various pots (only after elliciting embarassed giggling from the hostess when we asked her advice on what to eat), and sat down at a rickety table. Each member of the family wanted to bring us something, lingering by the table to grin at us as we ate. My meal was some combination of gingery beef innards, Ben got liver and potatoes, and Joe’s was perhaps blood soup. We finished our food with thanks and smiles, and continued up the hill. Towns gave way to rural roadside encampments and thick jungle. Dogs, less mangy than their urban counterparts, lazed in the streets unconcerned with our passing. Trash all but disappeared, and brush piles burned slowly in tidy yards while families congregated on front stoops. Nurseries boasted a dazzling array of exotic plants, and vibrant flowers dotted our peripheral vision as we sped by. An eco-tourist resort seemed garishly out of place, full of bikini-clad tourists, the road through flanked by ATVs and tack peddalers. The temperature cooled as we ascended the steep concrete and dirt roads, and soon we came to the trailhead for Casaroro Falls. We paid our 25 cent park entrance fee and began our descent into the river gorge, down 325 knee-high stairs of either concrete or welded rebar. It couldn’t be more picturesque. 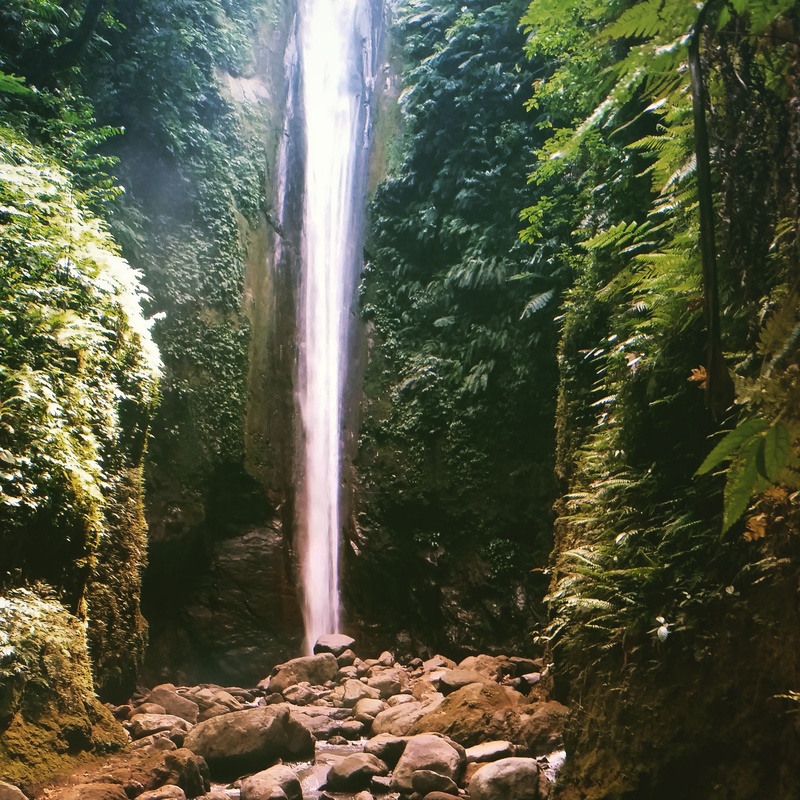 Casaroro Falls are almost 100 feet tall, plummeting unobstructed into a milky turquoise pool in a high-walled stone cul-de-sac. We had the place almost completely to ourselves, quite unlike the hordes one would endure at any similar site in the States. This is the sort of hidden paradise that can transport you to another time, even if briefly. For a time you can almost forget civilization, traffic, schedules, work, and smog. For a few minutes you can imagine what it might be like to explore somewhere untrodden, unmapped, unspoiled. We lingered for a while, lounging on the rocks under the cool spray from the roaring falls and dangling our feet in the river. We spotted a snake clinging to the moss-covered canyon wall, which we later identified as a juvenile Wagler’s Pit Viper. We also found some strange centipede with neon red legs moving like vibrant ribbons as it traversed the forest floor. The jungle is so beautiful and full of life. Now we sit at the charmingly tiny Dumaguete airport as we wait for our unsurprisingly late flight to Manila for a couple days of work before returning to Vietnam. 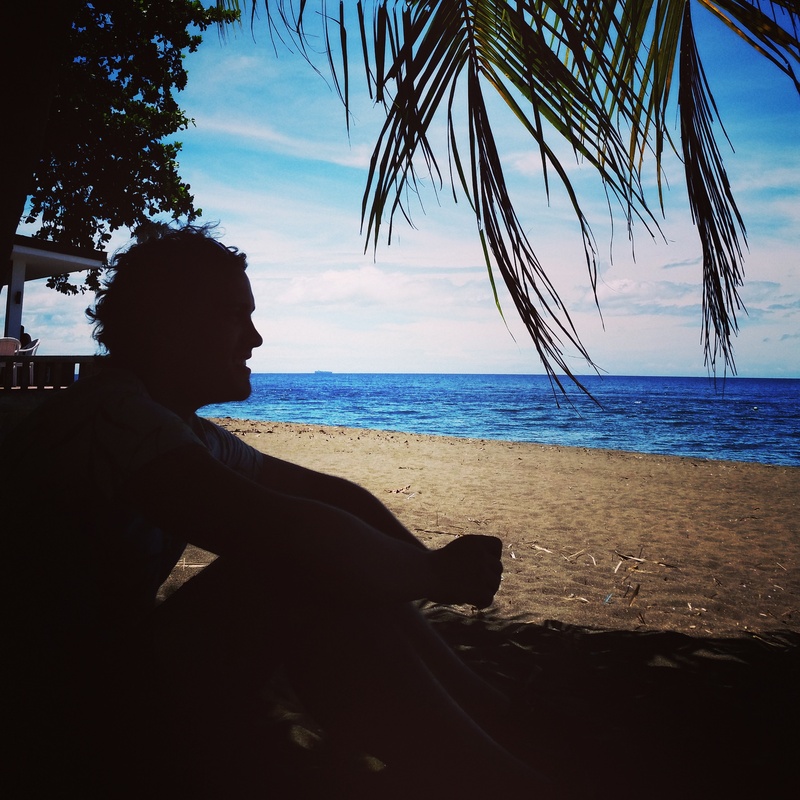 Thanks, Negros Oriental, for a great week. It’s been a pleasure, and I can’t imagine a nicer start to our vacation.